GEM has always taken temperature log files from the boilers when it installs its M2G Advanced Boiler Control (ABC). By charting and analysing each individual boiler cycle GEM can report on in-efficiencies in the system. This simple temperature log file was taken over 10 hours on a Leisure Centre boiler and shows the boiler nuisance cycling i.e. 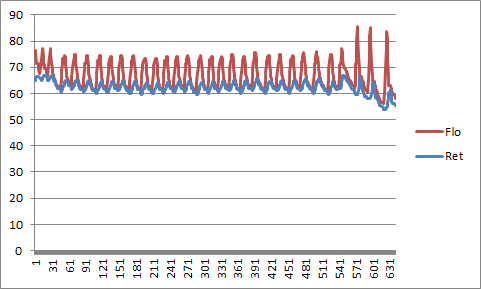 cycling on when there is no demand from the heating circuits (i.e. no deadband/temperature difference/Delta T) between the boiler flow and boiler return water temperatures. This is very wasteful of fuel (in this case Oil) and can also cause premature ageing of boiler plant.